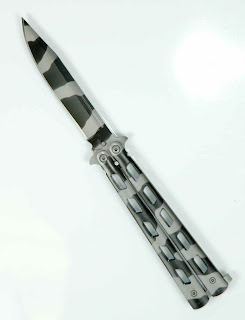 The Urban Slash Butterfly knife is one of our new butterfly knife arrivals. Built strong for durability, this balison has smooth action and a great look. Hex construction allows you to adjust the tension to your exact specifications. Two tang pins reduce wear and tear on the handles. Plus, the look is undeniably fantastic. Today–and through the weekend, the Urban Slash butterfly knife is one of our Blade of the Day offerings.